You don’t see it coming and suddenly there it is: an uncertainty about your future, a body that’s changing, and possibly feeling like you’re starting to lose a little of who you’ve been your whole life. Or maybe it’s a major health issue, sudden job loss, or the loss of your parents/spouse/friends/family members, or the narrowing down of options in your future as you face changes in health and finances. Ladies, there is another way. 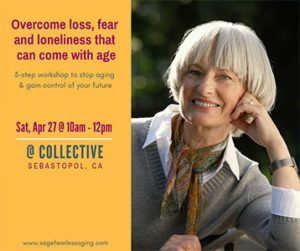 Join this workshop where you’ll learn the three steps to FEARLESS AGING, an approach to growing older that puts you in control of your aging options so you can thrive and live a long, vibrant life. Take the guesswork out of what’s next in your life. Gain personalized aging strategies to thrive instead of just get by. You’ll walk away with tips, ideas and resources that expand your options for a fuller and more certain approach to your third stage of life. FINALLY, THE “PILL FOR ANTI-AGING” IS AVAILABLE! Presenter: Pat Sanborn, MA, MS, health gerontologist, healthy ager, founder of Fearless Aging. She’s worked with 1000s of families to guide them through major transitions.